Use one hand to stretch the other, fingers down. You are looking for a stretch along the forearm. Hold 30 seconds. 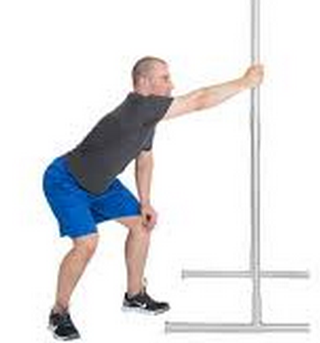 Standing, use a fence or pole to help stretch your arm out to the side, rotating your body away. You are looking for a stretch in the front of your chest. Hold 30 seconds. Use one hand to stretch the other, fingers up. You are looking for a stretch along the forearm. Hold 30 seconds. Standing, grab onto a pole or the fence. Sink back into your hips so that the arm is straight. You should feel a stretch underneath the arm. Hold for 30 seconds. Lay on your side, pinning your shoulder blade down. Roll onto your shoulder and gently press down, bringing your palm towards the floor. You should feel a stretch behind the shoulder or into the arm. Hold 30 seconds. Lay on your side, pinning your shoulder blade down. 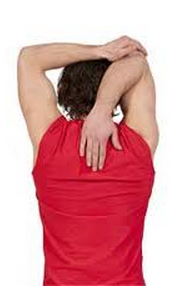 Roll onto your shoulder and gently lift your elbow up away from the floor. You should feel a stretch behind the shoulder. Hold 30 seconds. Bend your elbow and lift your arm up over your head. Gently stretch the elbow higher with your other hand. Hold for 30 seconds.